Wonk began writing the poems that make up the literary half of Nocturnes when he saw several photogravures that Sacabo had printed. Sacabo’s celebrated images feature dark, shadowy dreamscapes that speak to an ethereal and sometimes gothic sensibility, frequently influenced by literary figures and their work. Upon reading these poems, Sacabo was in turn inspired to seek out photographs and photogravures from her collections that resonated with Wonk’s verses. Nocturnes is the culmination of their literary/visual dialogue, a compendium of poetry and photogravures that speak to each other in an intrepidly designed and beautifully published book. Like Chopin’s nocturnes, Wonk’s poems and Sacabo’s images emphasize nuance and depth of expression, as well as a fin de siècle immersion in subjectivity. 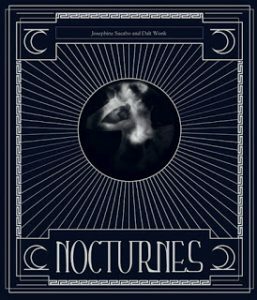 Nocturnes adheres to certain aesthetic details of that epoch as well: fonts are reminiscent of Art Nouveau typography, and poems are illustrated with stages of the moon, and printed on sheets of translucent vellum. Nocturnes presents something of a visual call-and-response: poems precede sets of photogravures that are grouped around a theme, image, or specific line in the title poem. Sacabo’s image “Severed Region of Time,” a photogravure that appears in conjunction with Wonk’s poem “Sleep,” depicts an abstract, aerial view of a mountainous valley with a sinuous bright river (the Styx, perhaps) that divides the dark and shadowy image, and cuts the valleys into two halves. “Sleep” is an ominous poem, presenting the unconscious state of sleep as a world more pernicious than fanciful. The series of Sacabo’s images that follow are vaguely foreboding. Some reflect direct lines (“On a river / that threads its ribbons through us / connecting the severed regions of time / the eye drifts like a luminescent fish.”), while others respond to the poem by creating their own visual narrative. Her haunting portraits of men and women in this series––which features the most photographs in any of the sections––are particularly entrancing. Sacabo’s images are symbolic as well, sometimes playing upon themes of allegory. Her work appeals to sensory experience and emotion over objectivity and intellect, which is why the photogravures in Nocturnes work so well with Wonk’s poems: nothing is literal, obvious, or rational. There is no forced cohesion of the works; they simply resonate with each other, like sustained piano notes. For Sacabo, such correspondences have always been present. The most important influences on her dreamlike, surrealist pictures––once inspired by the work of Clarence John Laughlin and Henri Cartier-Bresson­­––have been literary. Charles Baudelaire’s Spleen de Paris and Rainer Maria Rilke’s Duino Elegies were among the first poetic catalysts that inspired two series she shot in the mid-1980s in New Orleans. What is unique about Nocturnes and its authors is that, contrary to much contemporary art and poetry, their appreciation is based on visual, and especially non-rational, modes of understanding. The artists became interested in the idea of nocturnes (in Latin, “of the night”) as embodying an artistic threshold free of definition, a space where, as Keats put it, the artist “is capable of being in uncertainties, mysteries, doubts, without any irritable reaching after fact and reason.” For many, this is an alien and even undesirable state to be in, but Wonk and Sacabo are both comfortable there, or at least accustomed. Perhaps it is simply part of the nature of their work.